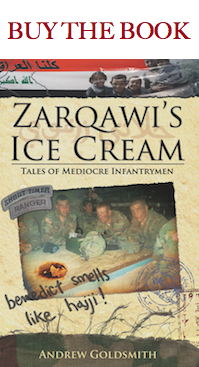 Zarqawi’s Ice Cream is now available for purchase. Just bought the book. Looking foward to reading it. Congrats on the book. Got the book in the mail yesterday; started reading it at 7:30 and was finished by 10:00. A great depiction of Infantry life. Goldsmith, you’re the Tim O’Brien of Generation “Y”. You did a fantastic job. Just heard about the book….. Congrats man! Congrats on the book Goldsmith. Felicidades Andres!!! I am so excited to read it! I bet it is as awesome as you are! Congrats man! Looking forward to reading it. That’s awesome, Andy. Can’t wait to read it. I cant wait to read it, even tho I wasnt military, I want to know about the experiences you guys had. Or @ least try to understand them…. This is so cool Andy! Love the cover, and the website and everything. Cant wait till it comes out! So proud of you! dude, this is pretty wild. i hope it works out. people gotta know how it really is. maybe you will change things. at least it will be entertaining. Cant wait to read this. Congradulations.